6 www.coalage.com January/February 2019 u.s. news Coal Barges Break Away in Kentucky; Salvage Work Commences The U.S. Army Corps of Engineers and the U.S. Coast Guard accepted a plan to allow salvage operations to begin on January 9 for the barges pinned against the McAlpine Dam on the Ohio River in Louisville, Kentucky. On December 25, a towing vessel, the Debbie Graham, was pushing 15 loaded coal barges upstream to two facilities in Trimble County when a barge hit the Clark Memorial Bridge, causing nine barges to break away and get pinned against the dam. Six barges were recovered, seven cap- sized and two remain afloat. The salvage crews, Big River Sal- vage and McKinney Salvage, under contract with Tennessee Valley Tow- ing, are staged at the upper McAlpine Dam site. Coal will be removed from the sunken barge above the fixed weir portion of the dam closest to the In- diana bank. The coal will be loaded onto empty barges at the scene. Sal- vage and recovery of the three barges closest to the Indiana bank will begin once the cargo has been removed, the Corps said. Salvage operations of the remain- ing barges requires the installation of anchor points in the Indiana bank. Installation of those anchors was ex- pected to begin soon, the Corps said. The Corps said it will continue to work with all parties to ensure the salvage operations are conducted as safely and efficiently as possible. 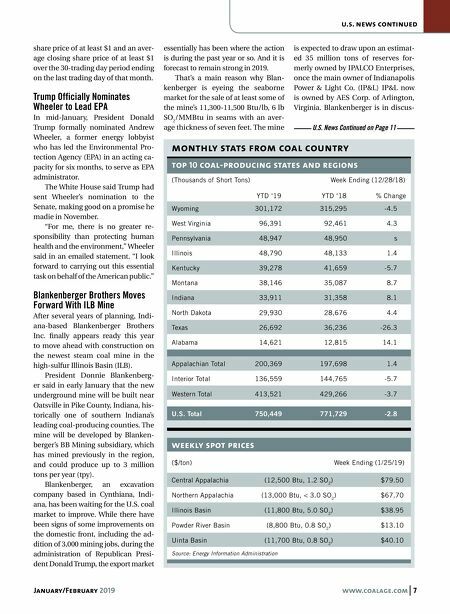 The coal was mined in western Kentucky and headed toward LG&E and KU's Trimble County and Ghent power plants, said LG&E spokeswom- an Natasha Collins. American Resources Signs Met Coal Sales Agreement American Resources Corp. signed a multiyear deal with an existing cus- tomer that will lengthen and expand its current agreement to supply at least 50,000 tons per month of metal- lurgical coal over the next two years, beginning in March. American Resources will pro- duce, process and load the coking coal for transport by rail at its McCoy Elkhorn Coal subsidiary located in Pike County, Kentucky. The expand- ed off-take agreement has an annual fixed price and will generate revenue of more than $58 million, with a to- tal contract value of more than $111 million over the two-year term. The contract will reprice in the second year based on market prices and cer- tain pricing collars, and it also has an option to expand tonnages. The cus- tomer has also provided a capital in- vestment to finish the Carnegie No. 1 mine rehabilitation and expansion, as well as production at the com- pany's PointRock mine. "We're very excited about this expanded partnership," said Mark Jensen, CEO at American Resources Corp. "Having these types of relation- ships allow us to have our coal broad- ly distributed to a diverse end-user base and enables us to execute on our growth objectives with a certain level of visibility. "We are actively working to in- crease the coal production at our Mine No. 15, Carnegie No. 1, and PointRock mines to satisfy this order and other sales opportunities for our metallurgical business, in addition to completing development of our Car- negie No. 2 mine to initiate produc- tion there as well." The current contracted tonnages under this agreement represent ap- proximately 30% of McCoy Elkhorn Coal's met coal production capabil- ities based on forecasted capex over the next year. Cloud Peak Breaks the Buck On December 26, Cloud Peak En- ergy was notified by the New York Stock Exchange (NYSE) that the av- erage closing price of the company's shares of common stock had fallen below $1 per share over a period of 30 consecutive trading days, which is the minimum average share price for continued listing on the NYSE. Under the NYSE's rules, the company has six months following receipt of the noti- fication to regain compliance with the minimum share price requirement. As required by the NYSE, Cloud Peak said it would notify the ex- change within 10 business days of its intent to cure the deficiency. 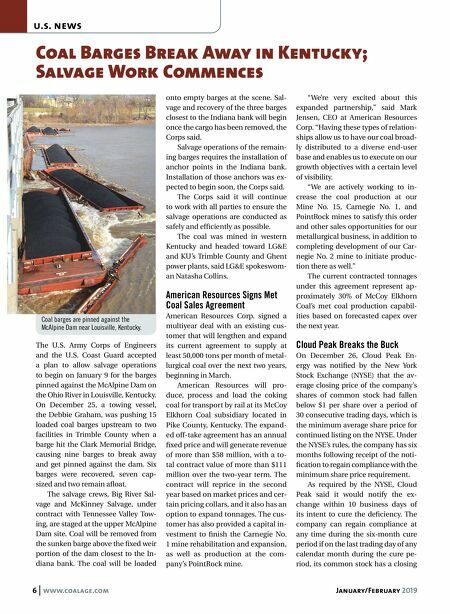 The company can regain compliance at any time during the six-month cure period if on the last trading day of any calendar month during the cure pe- riod, its common stock has a closing Coal barges are pinned against the McAlpine Dam near Louisville, Kentucky.